In 1890, an Italian scientist discovered a species of bat in Papua New Guinea that hasn't been spotted since then. It was thought the species had gone extinct because there had been no sightings in 120 years. However, student researchers from the University of Queensland Catherine Hughes and Julie Broken-Brow rediscovered the bat species during a field expedition in the Abau coastal district in Papua New Guinea's Central Province. Welcome back, Pharotis imogene! The researchers only had their bat traps up for two nights in this location, which means the capture was an extraordinarily lucky one. The specimen caught was euthanized and loaned to the Australian Museum in Sydney, where it was identified as being the long-lost species, the common name being the New Guinea big-eared bat. According to The Conversation, "The New Guinea big-eared bat, like the rest of the genera Pharotis and Nyctophilus, is distinguished by a combination of two features: large ears and a simple “nose-leaf” structure immediately behind the nostrils. Collectively, the group of species is known as long-eared (or big-eared) bats. P. imogene has larger ears than most." Learning more about the entire species through this recently caught specimen will help researchers in identifying species in the field, and also learn more about what conservation measures are needed to protect this and other bat species in Papua New Guinea. The New Guinea big-eared bat is listed as critically endangered (possibly extinct) by IUCN, as well as making it to the top 100 of the world’s most unique and endangered mammals. 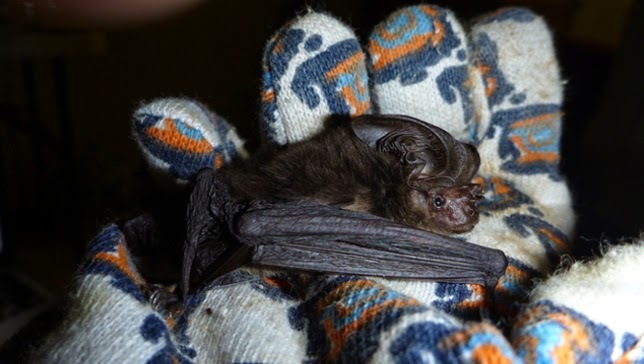 "Further studies need to be done to establish whether the New Guinea big-eared bat is one of a small number of mammal species endemic to the south-eastern peninsula region, or if it occurs more widely," Dr Leung told Science World Report. "Many of the coastal lowland habitats throughout Papua New Guinea are among the most threatened in the country due to clearing for logging and agriculture, and more field surveys of local bat populations could assess the conservation status of the species and inform future strategies to ensure their preservation." As Dr. Leung and Broken-Brow note in The Conversation, "PNG is one of the world’s biodiversity hotspots. The country accounts for about 7 percent of the world’s species diversity, with about 276 known mammal species, 314 freshwater fish, 641 amphibian and reptile species, 740 birds, and many more. According to the World Wildlife Fund, between 1998 and 2008, 1060 new species were discovered, including a blue-eyed spotted cuscus, a 2.5 metre freshwater shark, and a giant bent-toed gecko." And now, the rediscovery of a bat species not sighted in 120 years. The new capture location means the researchers know where to start looking to gather more data on this and other bat species, and sites for further ecological studies that can help in conservation efforts.